A column in the newspaper “HAPPY BAKING” a few days ago caught my attention. It said, “The smell of freshly baked bread, cakes and pastries don’t just stimulate our appetites - they make us nicer people too. French psychologists said that shoppers are more likely to alert a passer-by who has dropped something if at the time they are passing near a bakery”, The daily express reported. “Enticing food odours bring out the altruism in the best of us”, the research team said. The report is published in The journal of Social Psychology. Well, that is another very beautiful angle to baking. Baking bread has always been a joyous experience for me. It is therapeutic. 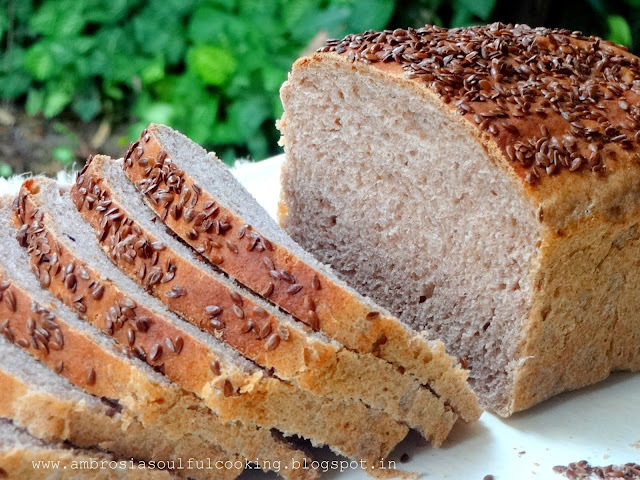 The entire exercise of kneading the dough to shaping it into a loaf, watching it rise and then baking it to a soft golden loaf which, while being baked suffuses the home with the heavenly aroma is definitely exhilarating. Fresh harvest of Finger millet- Raagi or Madua as locally known, has reached the market. 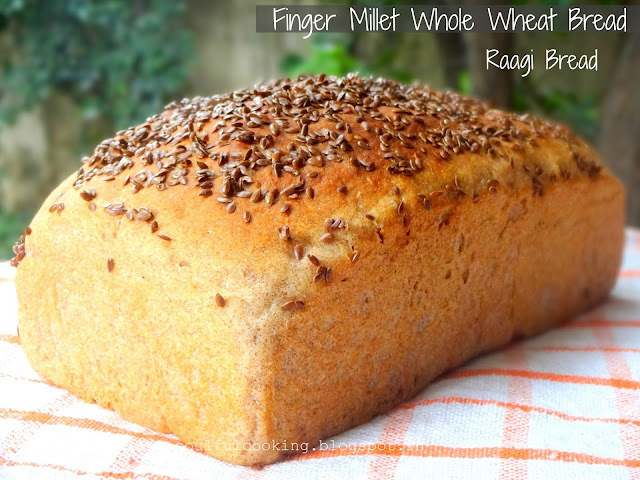 Since a long time I was contemplating on baking a bread using Raagi flour. I went ahead with the basic bread recipe and incorporated Raagi flour in it. The bread came out very well. 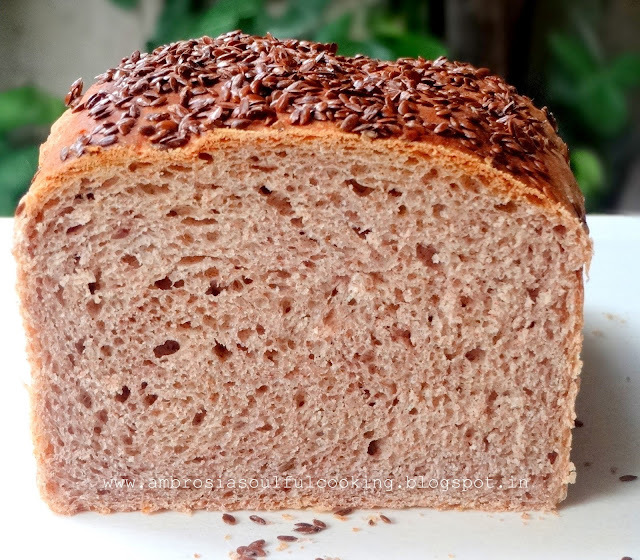 It was dense and crumbly as it had Raagi and whole wheat flour, but the taste was out of the world! Whisk together first three ingredients in a large bowl. Add olive oil. Add honey to warm water. Stir. Add yeast. Stir and let it sit for 15 minutes. Add water with yeast and honey to flour mix. Knead for 6 to 7 minutes till soft and supple. Add more water if needed. Let dough rest for 1-2 minute and knead again for 3 to 4 minutes. Transfer dough in an oiled bowl. Turn around so that it is evenly coated with oil. Cover and keep in a warm place to rise till it doubles. Grease one 8 x 4 inch loaf pan. Remove dough from bowl to the counter dusted with flour. Punch dough and knead for 2 minutes. Shape it into a loaf. Transfer to the prepared pan. Cover and leave to rise for 45 minutes to 1 hour or until it crests above the rim of the pan. Brush the top with milk wash ( ¼ cup milk, 1 tablespoon butter,2 teaspoon sugar, ¼ teaspoon salt. Boil together for 5 minutes on low heat) and sprinkle flax seeds. Bake in a preheated oven at 190 degrees C for 35 minutes. The loaf should turn beautiful brown from top and should sound hollow when tapped at the bottom. Remove from the pan after 5 minutes. Slice when cold or slice next day.